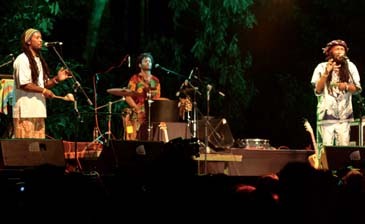 The Malaysian Tourism Office held their annual event "Rainforest World Music Festival" that shows various music performances. 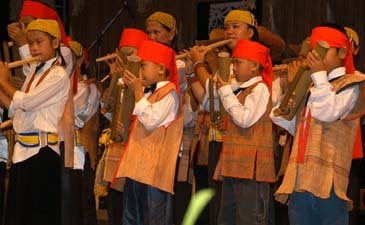 This 11th festival took place in "Sarawak Cultural Village" in Kuching, the capital of Sarawak from July 11 to 13, 2008. At this event, the well-known eco-tourism destination Sarawak showed its rich and abundant natural environment to the tourists. In addition, the attendants could have an opportunity for the world wide traditional instrumentalists' fabulous performance on double stages. From around 7 p.m. including stage performance, people enjoyed a music concert consisting of piano, flute, electronic guitar, and bagpipe. Also, tourists were able to enjoy drum dance, African folk music, a cappella and mixing. All of these performances released as the workshop on the day. Furthermore, "Rainforest World Crafts Bazaar" was able to exhibit Malaysian traditional hand-made and global artisans' highly delicate products during the event days. As the entries for this event, five local Malaysian teams and 11 overseas teams played natural sounds by their own created instruments. Greek quartet "Ross Daly Quartet" appeared with harmonious sounds using the "Cretan Lyra" and "Afgan Rabab." Four members of Congolese band "Kasai Masai" who play African native music in London made an unforgettable impression when they took the stage. 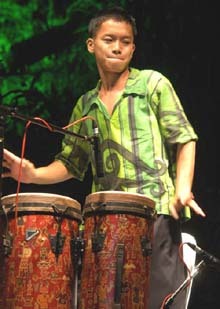 Moreover, there were performances by Japanese solo artist "Hiroshi Motofuji" who is best known for beating the Japanese drum Taiko and veteran Columbian musician "Cholo Valderamma" who has already released 16 albums about "Ilanero" which is a traditional South American cowboy sound. India, the United Kingdom, Guinea, the Philippines, Palestine, Portugal, and Poland also participated in the event. All of these countries' unique musicians showed off their full ability on the stage. Tickets are available at the tourism office in Kuching, Miri, Sibu branches. One day ticket is 90 MYR(ringgit) for adults, 45 MYR for children. Three days ticket is 250 MYR for adults, 100 MYR for children. If you have any queries, contact at +60-82-423600 or stb@sarawaktourism.com. Tucked away on the foothills of legendary Mount Santubong, 35 km away from Kuching is Sarawak's fascinating cultural showcase, the award winning "Sarawak Cultural Village." This living museum depicts the heritage of the major racial groups in Sarawak and conveniently portrays the respective lifestyle amidst 14 acres of equatorial vegetation. Here, it is possible to see Sarawak's ethnic diversity at a glance. The handicraft is both bewildering and tempting, including the Kain Songket (Malay cloth with gold inlay), Pua Kumbu (Iban housewives textiles), Melanau Terendak (sunhat), Bidayuh tambok (basket), Iban parang (swords), Orang Ulu wood carving and Chinese ceramic. The 45-minute cultural performance of songs, dances and entertainment is something you will not want to miss out during your visit to Sarawak.